Thanks Gary. Fast idle is the one thing i am facing. I should have stated this. Trying to post a picture, but have not figured that out yet. And i was trying to keep the original Monoblocs on it. For posting an image, use an image Hosting service, then put the image Hosting link of your image in your post on this forum. Gary: Snagged another West Coast A65HA. Nice shape, basket since the 70s, and somebody stole the engine years ago. I have an HA bottom end in my stash, so it'll look right. Has almost everything except that elusive tach cable clamp for the right side pipe. How is it that it seems all the "West Coast" versions with the TT pipes show up on the East Coast and all I have seen on the West Coast, including the four that I have owned over the years, have the high pipes? Has this been discussed already? I have to agree Bill. I bought the first one at the dealership near my house in 1965. High pipes. Unfortunately i sold it years later and had to have another one about 28 years ago and bought the one i have now. Go figure. Just have to get the carbs figured out. Good deal. Finding a basket case that is fairly complete is nice. I would suspect, and I'm far from all knowing, that some eastern dealers talked the west coast (BSA West) distributor into shipping them some west coast model Hornets. And/or some eastern dealers got the eastern distributor (BSA New Jersey) to get some west coast models for them. I know of no rule that the factory had about who got what. In researching the original production books in the UK in 2010, the particular machine line item entries do not indicate whether it/they are east coast or west coast models, only to which of the two US distributors they were dispatched to. In my particular case, the east coast model originally went to BSA New Jersey, and the west coast model originally went to BSA West. 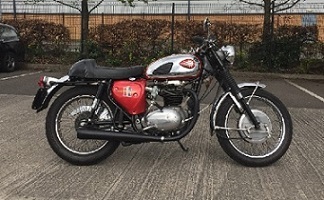 It would be interesting to know if anyone with a west coast model has a BSAOCUK dating certificate that shows it being dispatched to BSA New Jersey. Anyone? I'd like to see the documentation. I SPOKE TO THEOWNER OF EXPERT CYCLE IN HOBERT INDIANA SEVERAL YEAR AGO. 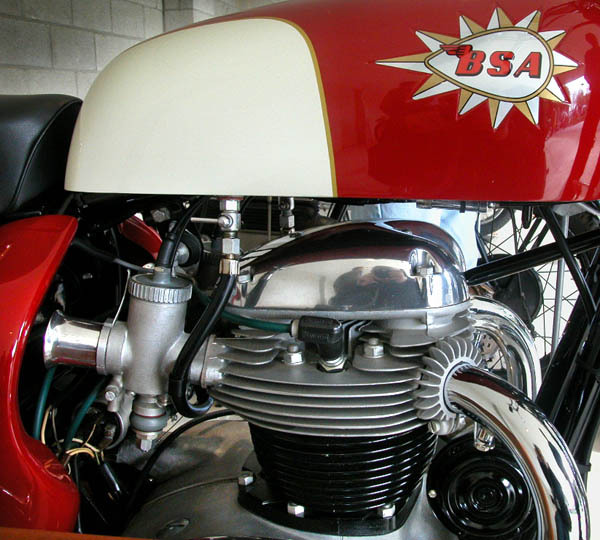 THEY WRE A BSA DEALER BECK IN THE 50'S AND 60'S WHEN HIS FATHER OWNED THE COMPANYS. HE USE TO ASSEMBLE THE BIKES WHEN THEY CAME IN. HE TOLD ME THAT HE REMENBERED ASSEMBLING A NUMBER OF WEST COAST HORNETS BACK IN THE DAY. Good info, thanks. It confirms my research/suspicion regarding where west coast models were distributed to. For the clamp try Matt Colling at MCS - https://www.eBay.co.uk/str/THE-MOTOR-CYCLE-SHOP?_pgn=4 - if you click on one of the items his contact details are at the bottom of the page. He doesn't appear to have one advertised at the moment but a couple of years ago he had a quantity of them but didn't know what they were until I told him. Interesting that a UK supplier would have them since the Hornets were export only. He has the old Ted Bloomfield MCS Leytonstone stock. Ted had all sorts of wonderful stuff that came out of the factory at the end. I have been told that some of the big dealers like Vale-Onslow and Bob Joyner cleared lorry loads of miscellaneous parts from Montgomery Street in lieu of outstanding warranty claims. All this stuff went into the trade. Yes, I'd like to know also, so I can add the set to the TT pipe database. The listing narrative description wasn't quite right, but it turned out fine for the seller. The last three bids were snipes within seconds of the auction closing. It gives me an idea of what my extra NOS set might be worth (nicer with no peeling chrome). At $482 gross, net is about $395 to the seller after eBay and Paypal fees. VicCyclone: Man, thanks for that. I got one on the way. My west coast Hornet is coming together. It will be a AHRMA TT/Flat track bike. I've got a set of 1 3/8" id TT pipes for it and my question is carbs. I'm going to put 32mm MK1's on it. What was the Monobloc carb set up: Slide, needle jet, idle jet main jet? If you know the settings for the MK1 Concentrics I would love to know what they are even if it 30mm carb settings. Are the TT pipe originals or after-market? 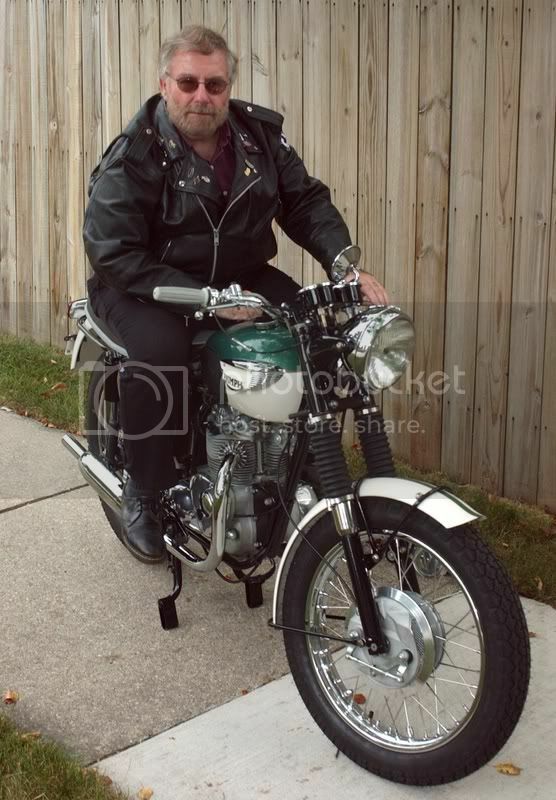 Side note: My '68 Spitfire with the bigger carbs & internals does not like low RPM operation. It gurgles, coughs, and hesitates during in-town stop and go traffic. It wants to be throttled up. Last edited by Gary E; 10/26/18 1:46 am. Could that be down to blocked pilot circuits or the 67/68 rich 2 stroke jetting? I run 932's with small port heads and later Lightning heads without bottom end hesitation, but it is setup with 4 stroke jetting. I’m not understanding this Allan. 2 stroke jetting? Gary - After market 1 3/8 ID pipes. Were the originals different? 1 1/2? Consensus is that I should have 1 1/2 ID Pipes for top end rpm. Originals are 1 3/8" ID. Semper, the pipe size is normally quoted in O/D, I/D of the pipe can vary depending on the wall thickness used. Cheap pipes have a 1mm wall, better pipes have a 1.5mm wall. 2 stroke jetting: pre 69’ all Concentric carbs were jetted with what later became known as 2 stroke jets. Needle jets and needles were different, also the spray tube (full slant for 2 strokes, flat for 4 strokes and half flat half slant on triple cylinder engines) . Apart from the addition of air bleed holes in the 4 stroke needle jet the jet wall is thicker all the way to the top of the jet on the 2 strokes. On the 4 stroke it thins out half way. 4 stroke jetting by its design burns a little leaner, but AMAL didn’t have this solution until 69. For this reason I always try and find out for what application people are using a carb for when I sell one, if they ask for a carb for a 67 or 68, I find out if any other changes were issued then recommend a carb from there.